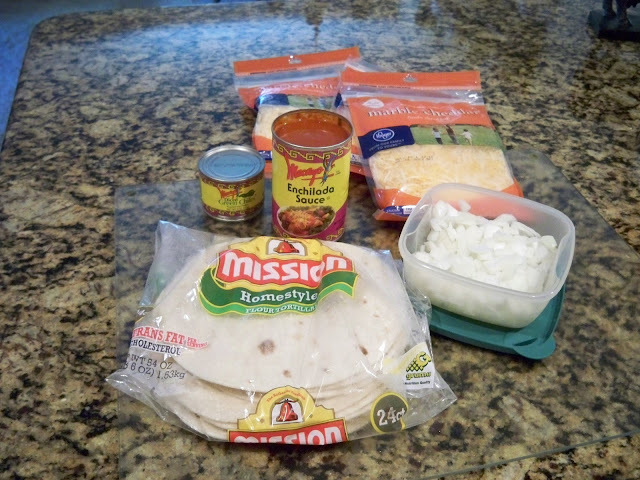 Since I mentioned these receipes in my recent Mexican Feast Under $10 post, I have had tons of comments, so I thought maybe it was time to repost it. Hope you enjoy. With gas prices rising again and the economy in general, I keep seeing how so many friends are really trying to save every way that they can. Eating at home is one way to definitely save. For many years as my children were growing up I was a single working mom, so I not only couldn't afford to go out to eat or fast food, I didn't want my children to grow up eating that way. I wanted us to have family time around the table and for our meals to be nourishing, tasteful and healthy. Dinner time was mandetory at our house and a lot of their friends always showed up too, so it was a time for all of us to enjoy each other and for other children to enjoy some family time. 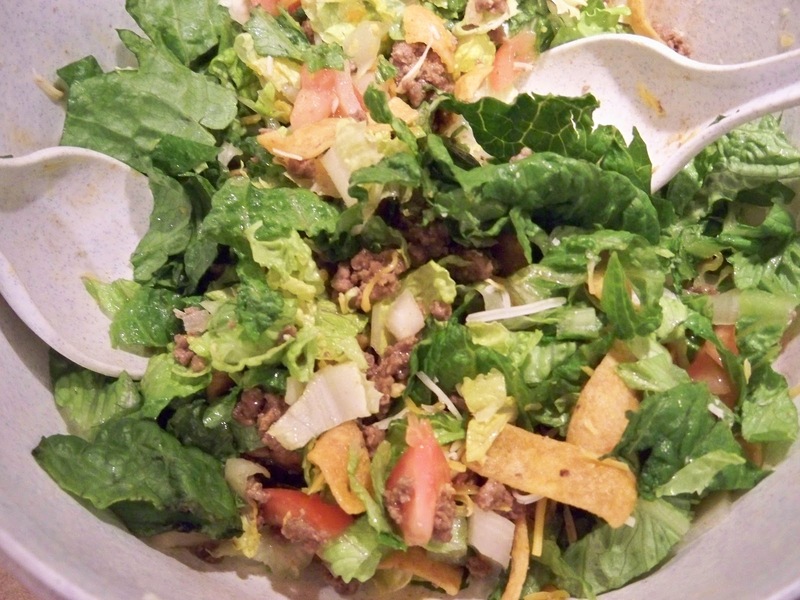 Hamburger was a mainstay in our diet, and so I figured out a lot of different ways to use it. We usually had something made with hamburger at least 2 to 3 times a week. 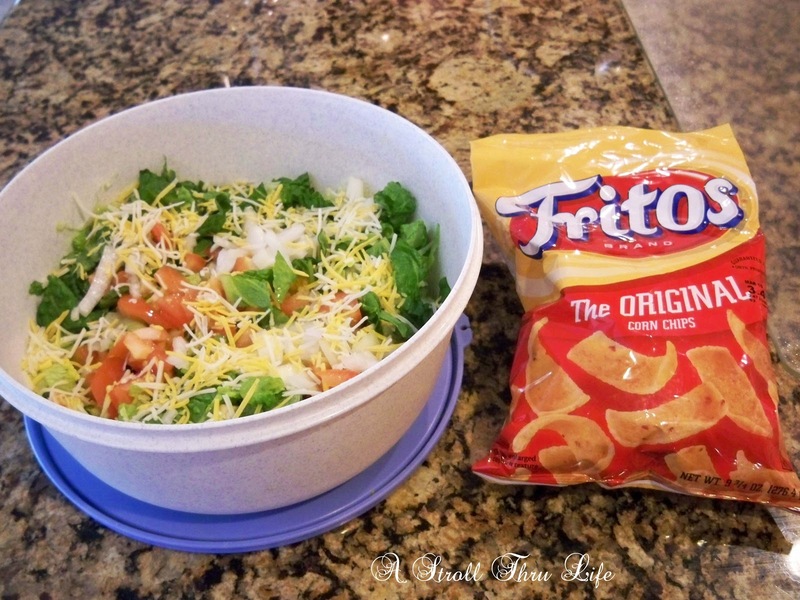 I found several ways to make quick and easy meals so I didn't feel so much pressure when I got home from work and meals could be on the table in 30 minutes or less, plus I still had time to help with homework. My favorite tip is to buy hamburger in bulk. I buy it in huge packages and usually at least 5 lbs or more. When I get it home, I brown all 5 lbs. when I start to cook the first meal. 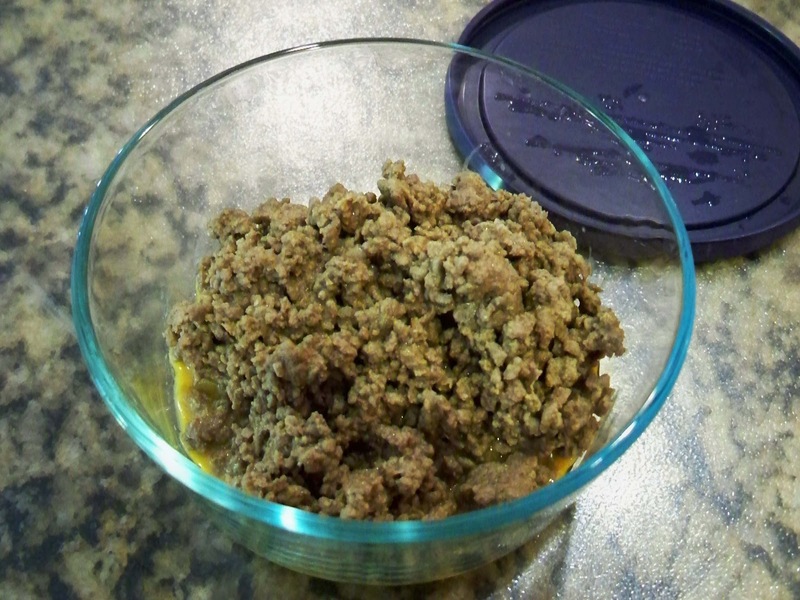 I then take out 4 lbs., place in a bowl and when it is cool put in the freezer in 1lb. freezer bags. This is the basis for 4 more meals in a hurry. The secret to having the meat taste freshly cooked is to only brown it just past the pink stage. Do not cook it all the way before freezing. I showed you this one a while back and it is a real crowd pleaser and serves a ton of people for a really small price. Warm up one package of your cooked ground meat, add your favorite Taco seasoning, and serve with shredded lettuce, diced tomatoes, shredded cheese, chopped onions and refried beans. Some spanish rice is also a great side that's easy to make while you are getting everything else ready. Add 1/2 can cream of mushroom soup (do not delute), chopped onion and some garlic salt to 1 pkg of browned meat. Fill cleaned Green Peppers with the mixture, place in a casserole dish. Add 1/3c. 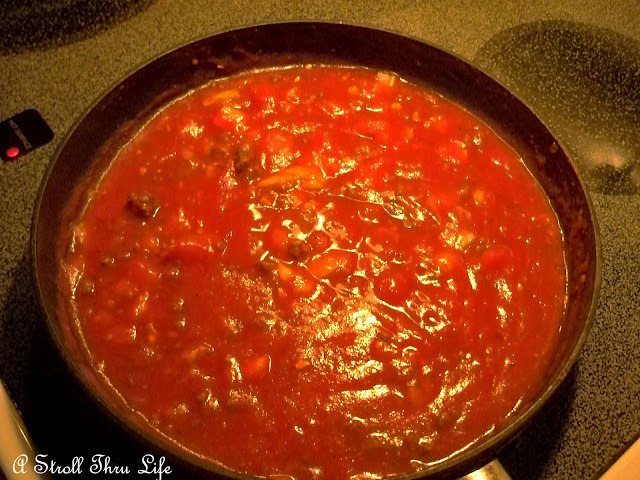 water to the 1/2can remaining soup, mix well, then pour over the peppers. Bake in oven until meat and peppers are completely done. 350 degrees for approx. 30 minutes. Serve with a baked potato (they can cook in the oven with the peppers, then finish them off in the micro.) or rice pilaf and salad. 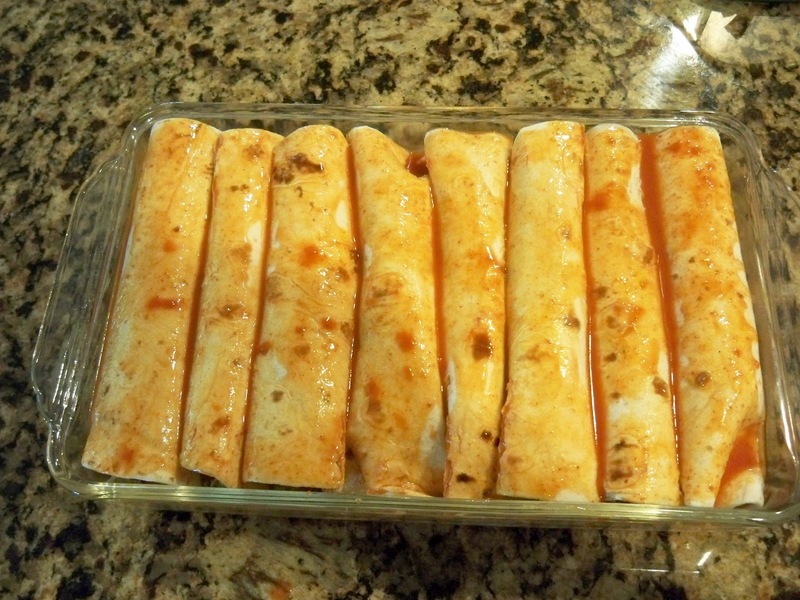 I love to make enchiladas, I call them the garbage meal since you can use any kind of meat you want, chicken, beef, shrimp or pork. The other fillings can be as varied as you like. 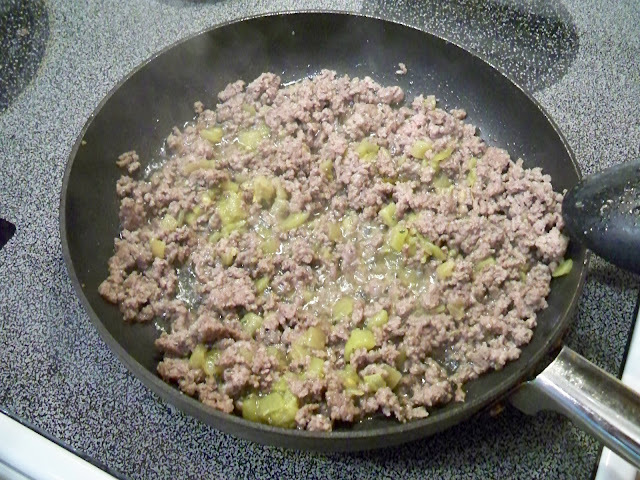 Today I am making some really plain ones using ground beef, chopped green chilis, onions and cheese. Add a small can of chopped green chilis to one of your browned beef packages and cook until done. Ladle a generous amount of enchilada sause, (I am using red or you could use green) on a flour tortilla and spoon on some of the meat mixture. 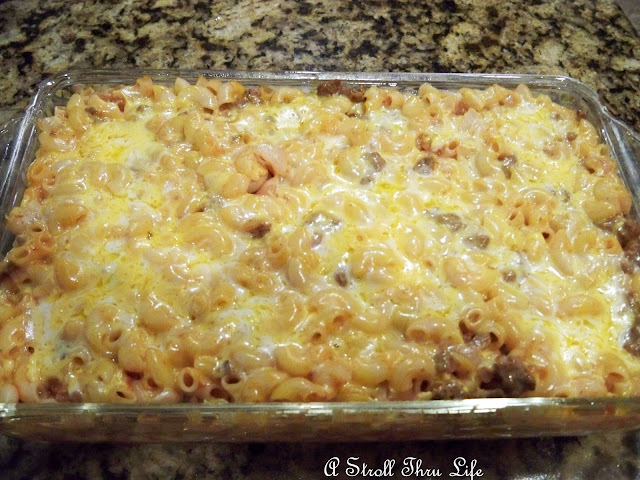 Add some chopped onions, shredded cheese and anything else you like. I usually add chopped black olives, but I was out this time. Roll up and place in baking dish and continue until all of the meat mixture is finished, usually around 8 enchiladas. 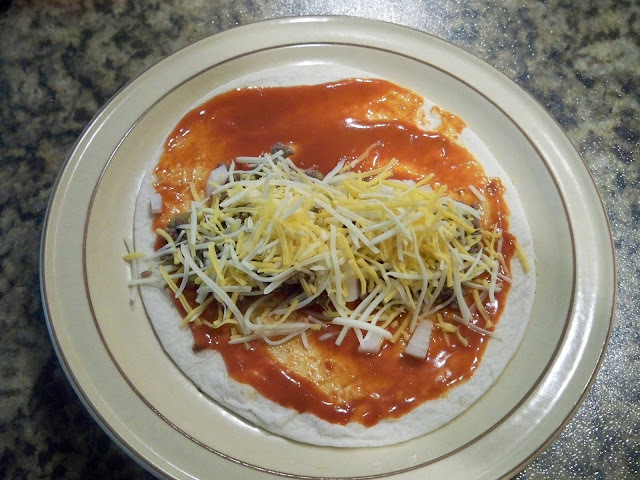 Cover all of the enchiladas with the remaining enchilada sauce. 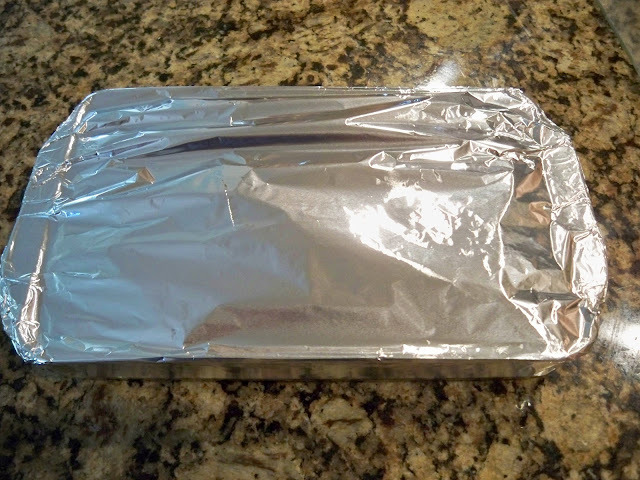 Then cover tightly with foil that has been sprayed so it doesn't stick to the cheese. Bake in 350 oven for approx 35 to 45 minutes or until you can see the sauce bubbling in the bottom of the pan. 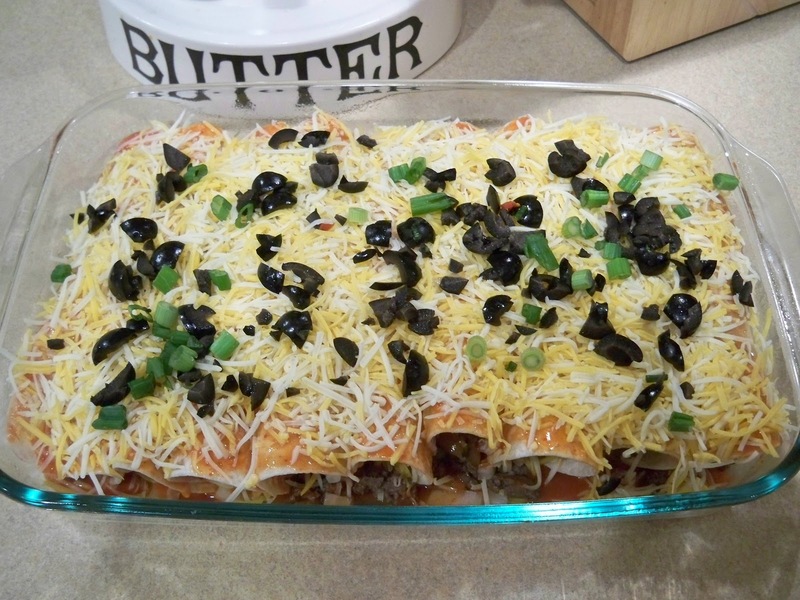 Serve with Spanish rice, refried beans or salad. You can have condiments of sour cream and guacamole on the side for an extra special dish. 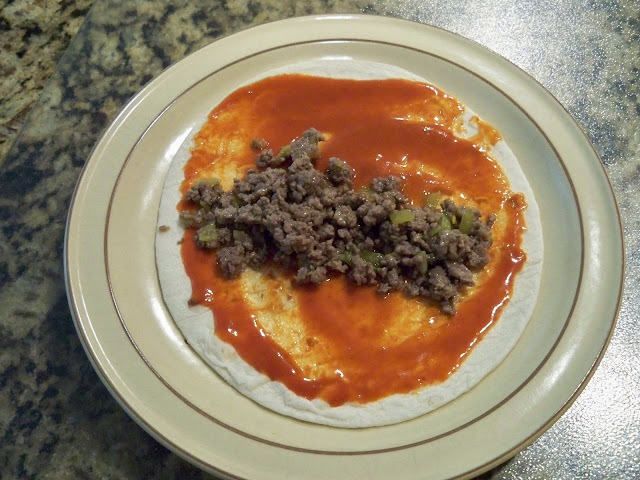 Now obviously we had a lot of different meals mixed in with these, however these were just a few of the really fast and easy, yet nourishing meals that we enjoyed with our browned meat. I know you have a dozen or more meals of your own, but how about Chili as another fast and easy meal using your browned meat. Add a can of Cream of Mushroom soup to the browned meat and serve over egg noodles for another fabulous meal. 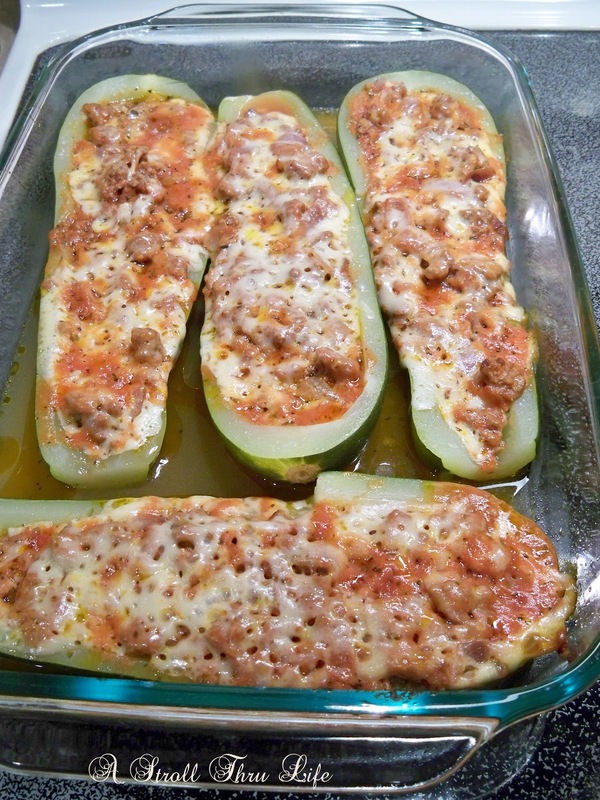 or another favorite is Stuffed Baked Zucchini. I think the most important thing is to have a good meal on the table in a short amount of time that doesn't have you feeling all flustered. 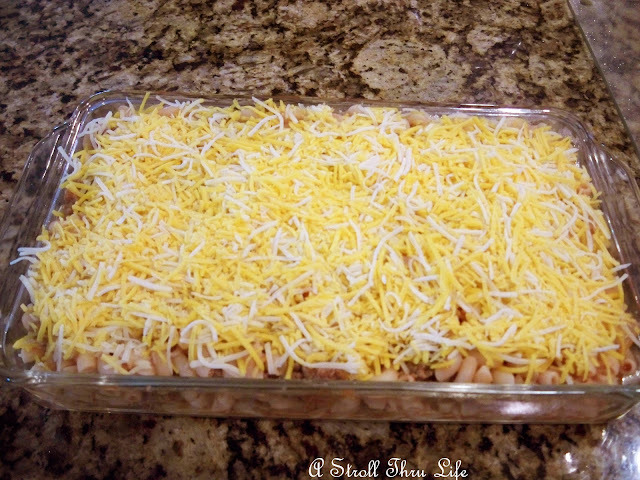 Something that you can have in the oven or simmering on the stove while you change clothes and get ready for a nice evening at home and allow all the stress of the day to go away. Time to sit down with the family, visit, catch up on the days events, and eating a nourishing meal all at the same time is the best reward to the end of the day. I didn't even mind cleaning up the kitchen because that was the time that I finished helping the children with their homework and it also gave us time for some one on one. Best time of day. I also kept that crockpot going constantly too, but then that's another story. So, how do you juggle all the stress of work and keeping up with your family plus stay on budget? With 8 kids and a hubby to feed, I too used many of your ground beef dishes. I'm sorry to see how much it costs for a lb. of ground beef now. You really have to stretch the meat to stay in budget. Thanks for the recipes - even tho my kids are grown I still make most of the meals just because we like them.. This post brought back fond memories of my childhood. My aunt grew zuchinni and would prepare it nine thousand ways. I loved the zuchinni boats! Marty,this is exactly what I needed to find. Fantastic photos and step-by-steps. Hi Marty! I love this! I love your idea of cooking all of the meat first and then freezing it! Especially not quite browning it through, I would never have thought of that! Thank you for these! Yum Marty. Thanks for all the great recipes. We use lots of ground beef, too. You are starving me with all these dishes!! Yum-mee!!!! Marty, they all look delicous! 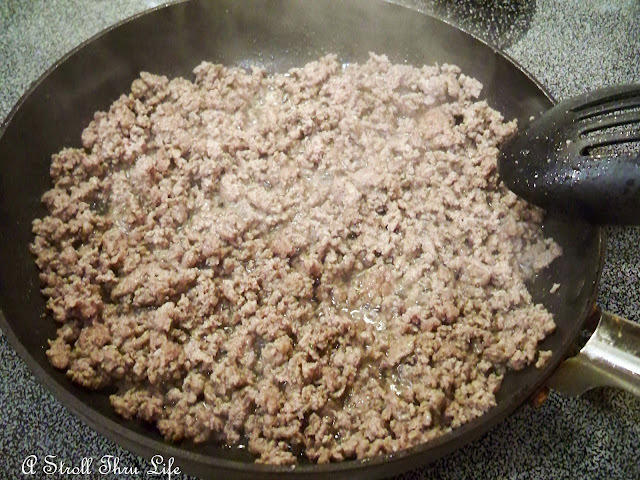 I love the idea of cooking your ground beef before freezing. Thanks for the great tip! With two weddings coming up this year make ahead meals like this are what we need. Great menu!